Tesla has released the first teaser image for the Model Y, the automaker’s upcoming all-electric compact SUV. The image was unveiled at Tesla’s 2017 Annual Shareholder Meeting at the Computer History Museum in Mountain View, CA. CEO Elon Musk also reiterated Tesla’s change of plan to make the vehicle on a new platform. Tesla originally planned to build the small SUV on the same platform as the Model 3, but they are now looking at a whole new platform. Earlier this month, Musk said that the new platform would be ready for production in “late 2019 to 2020”. 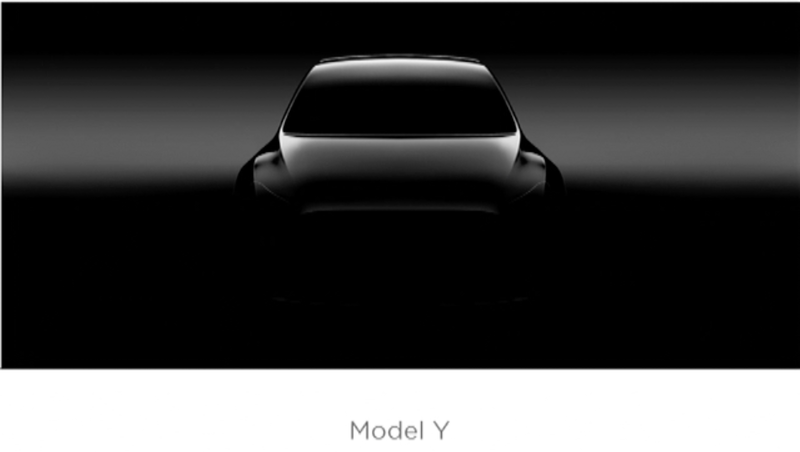 It’s not showing much, but it has similar lines as the Model 3 and it almost looks like there’s a nosecone. Tesla is also again trying its luck without side mirrors, something it tried to introduce since the Model X, but the regulators have not authorized it yet in most markets. At the shareholder meeting today, Musk also said that he expects the vehicle to be even more popular than the Model 3. When talking about the new Model Y platform last month, he said that Tesla will get rid of the 12-volt battery architecture. It means no more lead-acid battery and a different way to power in-car electronics. Musk says that they will reduce the overall wiring significantly and simplify the production process. He added that Gigafactory 1 will likely produce the battery packs for the car, but a new factory will be built for the vehicle production lines. There’s still no word on when the vehicle will be unveiled, but Musk did say that there will be something more to unveil at the Tesla Semi unveiling, but it’s unlikely to be a car at this point. What do you think? Let us know in the comment section below.